(Natural News) Your favorite nonstick pan may give you picture-perfect pancakes and let you fry an egg with relative ease – but is it really worth the risk? 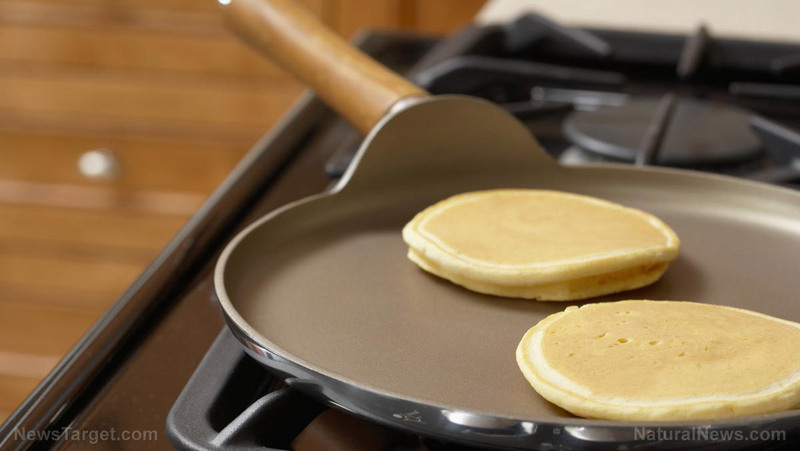 Many nonstick pans and utensils are made with toxic chemicals, known as per- and polyfluoroalkyl substances (PFASs) and perfluorooctanoic acid (PFOA) – both belong to a group of toxins known as “perfluorinated chemicals” or PFCs for short. These same toxins can also be found in water-resistant packaging and stain-resistant carpeting. In other words, items that contain sources of PFAS and PFOA can be found in a majority of homes nationwide. Teflon is perhaps the most infamous source of PFOA. Using pans coated with Teflon at high heat can cause toxic PFOA to leach into food – but new research has shown that the contamination power of PFCs is far more potent than previously thought. And its potential to linger in the environment and the human body have given rise to even more concern. Studies show that drinking water in 33 different states, from New Jersey to California, has been contaminated with PFAS – in levels at or above the EPA’s suggested limit. And these chemicals aren’t just lurking in the water – they’re also hiding in your body. Test results from a 2015 study found PFAS in 97 percent of human blood samples. Even the EPA has reportedly declared that these chemicals are “likely carcinogens,” and yet nothing has been done to stop PFCs from entering our homes and the environment. As Pew Charitable Trusts explains, these chemicals are notoriously difficult to break down. And while they are known for their ability to stand up to high temperatures, they are not immune: PFASs do experience microscopic breakdown at high heat. These tiny particles end up in your food, your water and your body. More alarmingly, as these chemicals breakdown, the toxins can take on an aerosol form, which means they can be inhaled. Reports suggest that even just a single exposure to PFCs such as PFAS and PFOA can leave you with traces of the chemicals for decades. High concentrations of these chemicals have been linked to heart disease, stroke, weakened immune systems, high cholesterol and cancer. PFOA has another name, C8. And C8 has been linked to six different diseases, including kidney cancer and testicular cancer. C8 is so persistent, and the contamination so widespread, that nearly every American citizen has traces of it in their blood. No region exhibits how toxic the effects of Teflon and similar chemicals really are like the Midwest, especially near where DuPont produced their Teflon products. The region has been hit so hard by the after-effects of mass-producing nonstick materials that the area has earned a rather bleak nickname: Cancer Alley. Evidence has shown that DuPont higher-ups were aware of their product’s toxicity and went to great lengths to hide the danger it posed for decades. But it’s not just DuPont: PFCs are used by many, many companies for a number of different applications. As far as cookware goes, there are many other options beyond nonstick: Stainless steel, cast iron, ceramic, and stoneware, just to name a few. Learn more about what dangers are hiding in your kitchen and around your home at Toxins.news.